Late in the evening of my night’s stay in Saint Jean Pied de Port, having just completed the walk from Prague and looking forward to an early morning start to the Camino Frances/French Way, the two Italian pilgrims whom I had met earlier and myself were standing outside our albergue when we were met by a slightly odd looking pilgrim with a completely white, long beard. 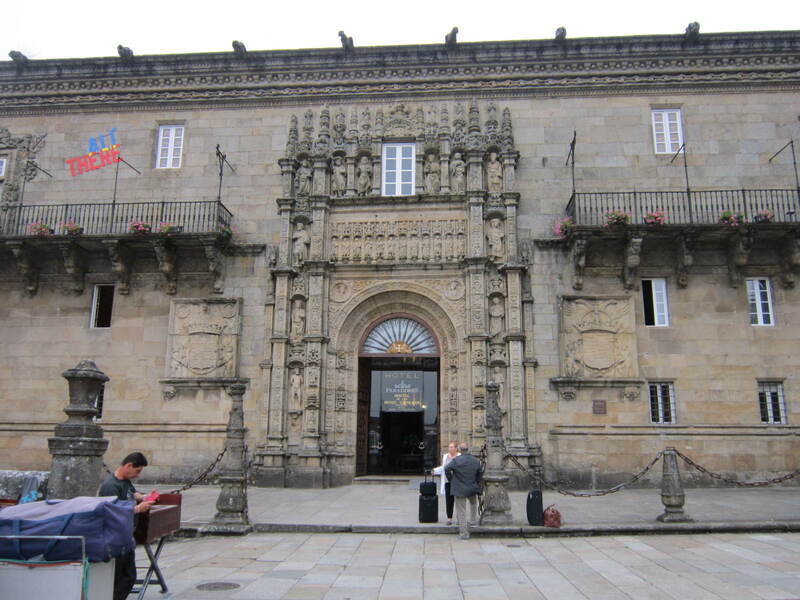 He evoked an aura of a well-traveled pilgrim and as we gazed uncertainly into his almost mystic gaze he told us of the Hotel Parador in Santiago de Compostela; the poshest hotel in the city and where a few lucky pilgrims could feast to their heart’s content on 5 star hotel food. 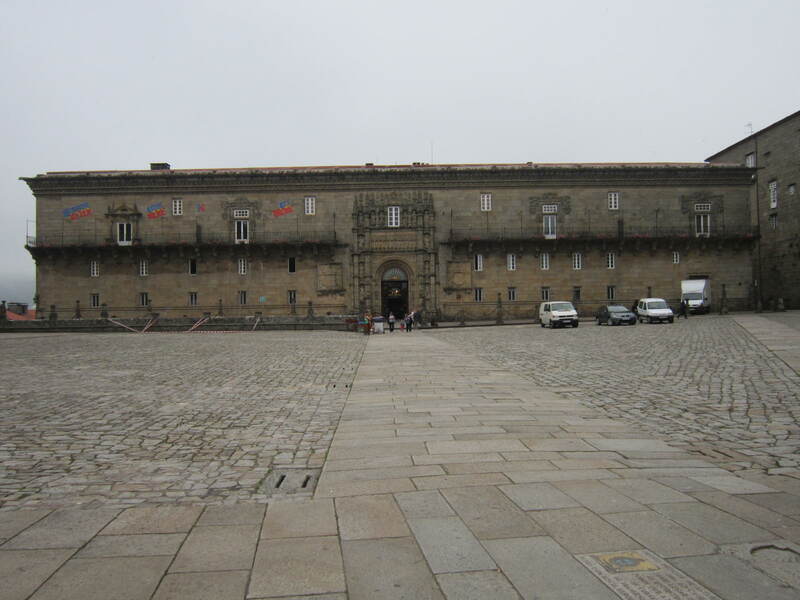 He also mentioned that for one extremely fortunate pilgrim, he or she would be given a complimentary night’s stay in one of the Parador’s upstair suites. He relayed these tales with an absolute seriousness and topped the story off by rummaging in his worn trousers and producing a set of hotel room keys with the Parador logo inscribed on, which he proceeded to jangle in front of us and with a manic laugh to add effect. 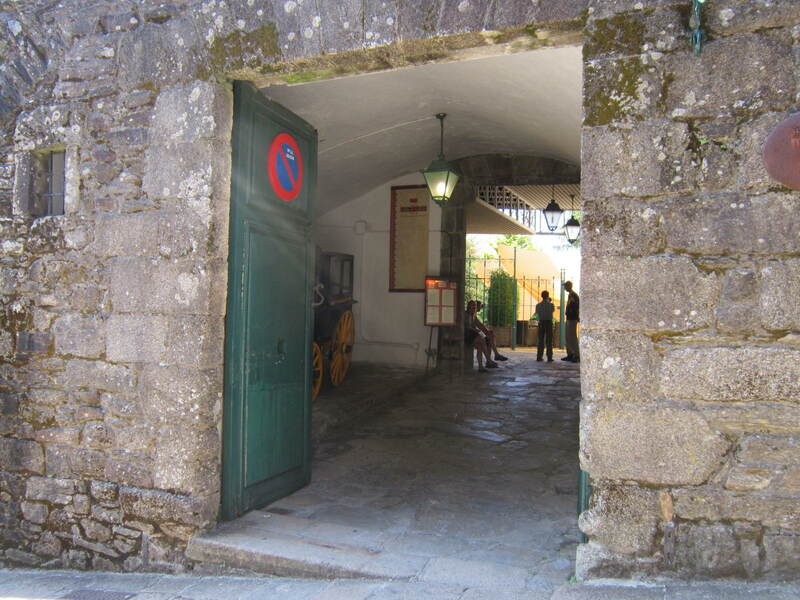 During my Camino I spoke about these stories with other pilgrims. Some agreed that it was possible, while others dismissed the stories as tales clearly smelling of the product which emanates from the rear of a male cow. Please remember that you can click on any photo to enlarge. Thank you. When I arrived I read this sign and realised that I hadn’t brought with me my credencial or compostela, neither any identification, so I ran back to my room to grab them and then raced back to the green door of the hotel garage just in time for the evening meal. An evening meal btw which I had high expectations of. The time came for us to be met and as we numbered less than 10 there was no need for anyone to be turned away. Nobody checked any of my documents and I suddenly found myself walking back up the steps and through the main door of the hotel with a group of people I had not known 5 minutes earlier. 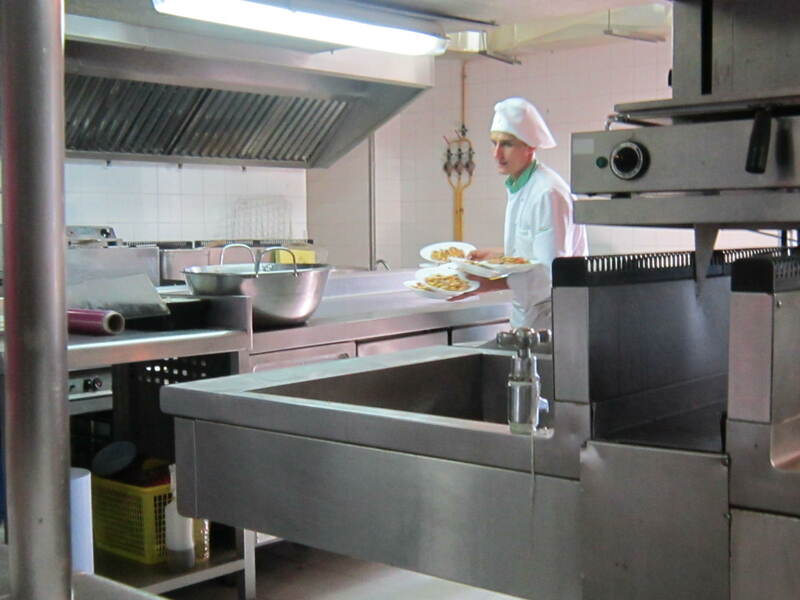 We were whisked through the hotel public areas, a little like we had a contagious disease, and found ourselves in the hotel workers eating quarters. 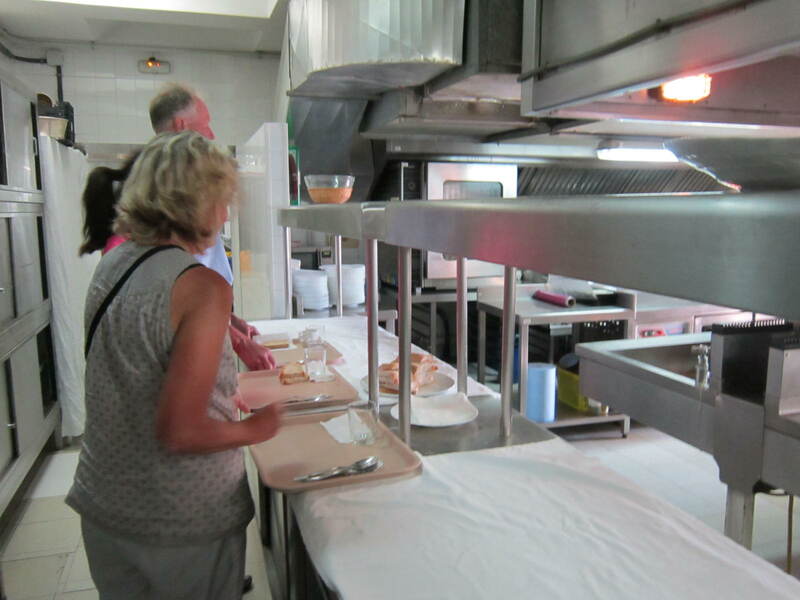 We each grabbed a tray and items of food were dolloped onto plates in front of us, which we then manually shifted onto our trays. 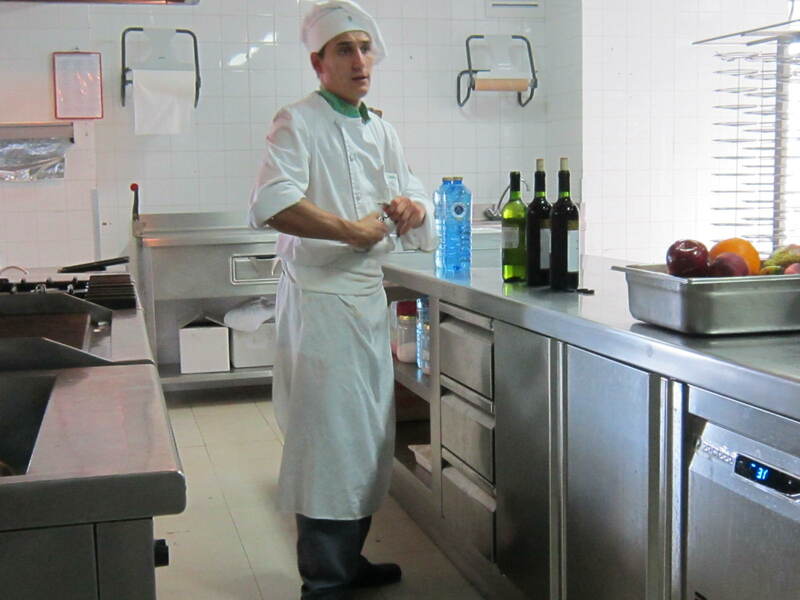 Interestingly a lot of (cheap) wine bottles were provided; too much for the number of us present at the mealtime. 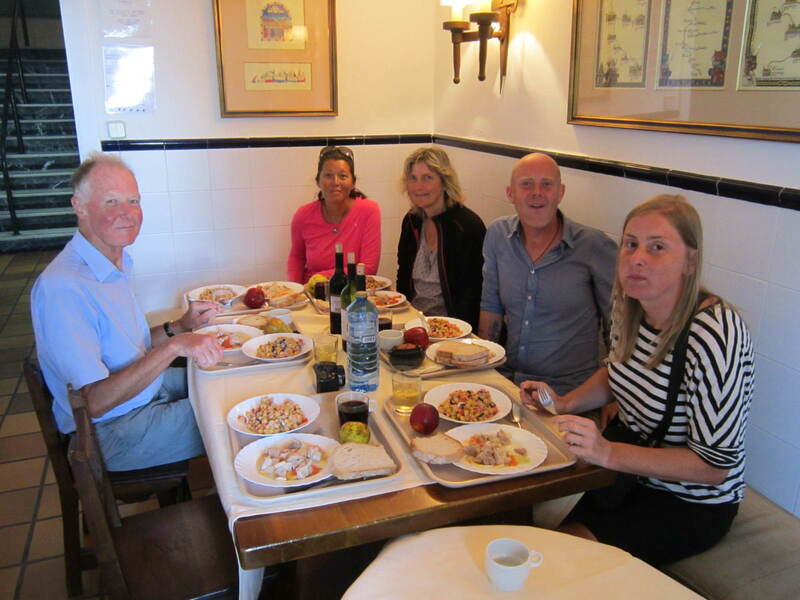 We drank wine, we shovelled up the free food, we celebrated what was to be for me my last joint pilgrim experience of my Camino (apart from of course meeting Ines and her husband directly after the meal). 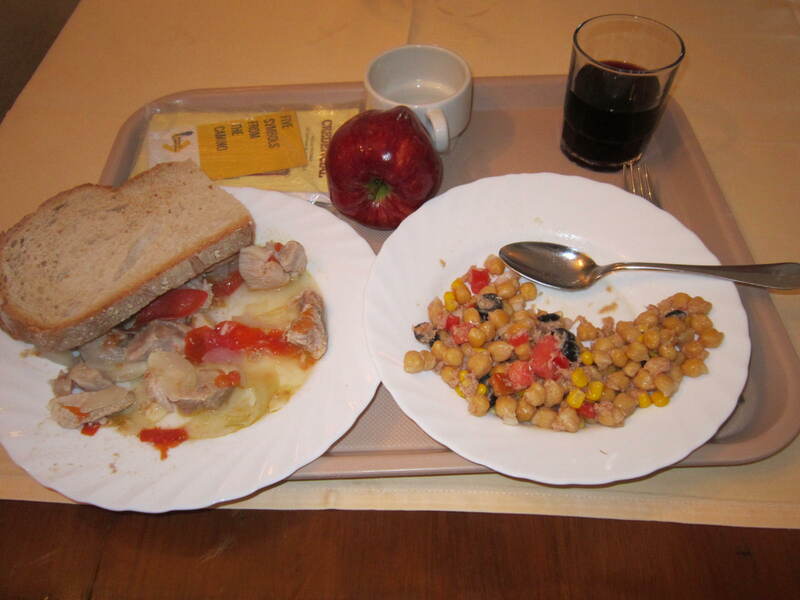 Btw, I never did find out whether the story of the hotel letting out one of their penthouse suites for the night to a random pilgrim was true or not, but based on the meal experience I would tend to doubt it and put it down to being a Camino myth. 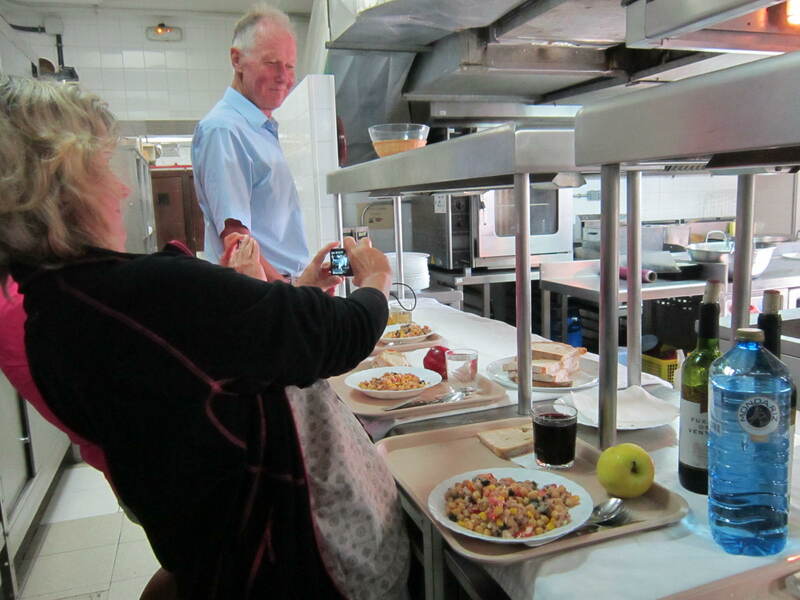 If you have any questions about free pilgrim meal(s) in Santiago de Compostela or if you wish to add information, then please feel free to leave a comment or question in the Reply box below. Thanks for sharing such a wonderful story. 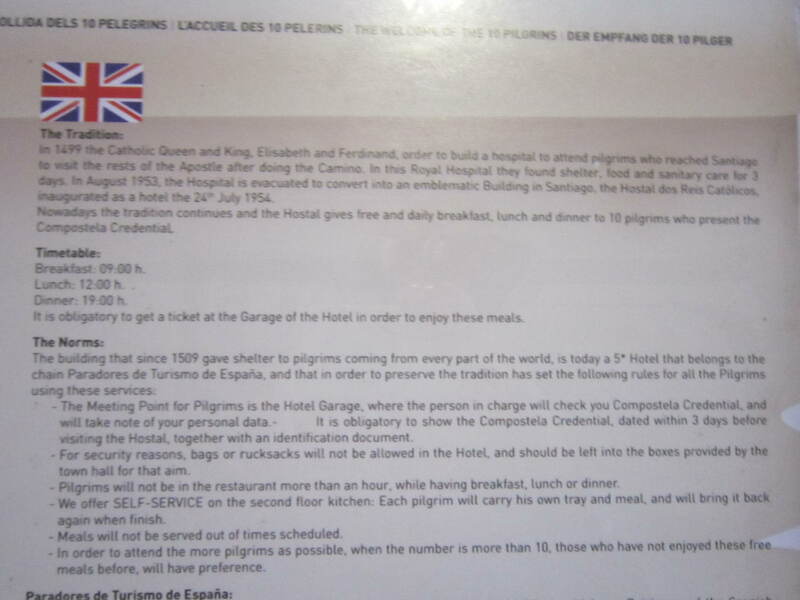 As far I can tell, the current method of obtaining the free meal (2018) includes getting a “ticket” at the office when you obtain your compostela certificate. First 10 people a day to ask for the meal ticket.